It’s a Bird is a story about Huntington’s Disease in the way that Art Spiegelman’s Maus is about Nazis. It may form a central construct of the story, but more than that, It’s a Bird is an experiential tale exploring how a genetically inherited, untreatable disease effects the narrator and his relationships with siblings, parents, and significant others. The comic never gives a didactic exposition on the science behind the disease, but instead, explains how the author has come to learn about the condition in bits and pieces. And the tale is truly told in bits and pieces, eschewing a standard chronological structure for flashbacks, flash forwards, stand-alone vignettes, and fourth-wall-destroying direct address by the author to his audience. Along with the disparate artistic styles employed by Kristensen, it is a truly jarring, unsettling experience for the reader until you realize that this is how our narrator is processing the overwhelming information he is given: each splintered panel and word balloon mimics the writhing, jerking, morbid “dance” that characterizes Huntington’s chorea. Steve is a comic book writer who has been offered The Dream Gig of writing Superman. But he cannot bring himself to take the job, because he can’t reconcile his life of vulnerability with the invulnerability of Kal-El, not when his grandmother dies of Huntington’s disease at the very time he discovers Superman comics. In his rejection of the Superman Ideal, he rejects his entire support system — from his girlfriend, to his parents, to his sibling, to his editors, to Supes himself. He gives then-Superman author Joe Allen a left hook on the chin over slightly differing points-of-view. It is a shocking sequence, or rather it would be if this were any other narrator than Steve. Our fearful hero is not likeable in almost every way. Judgmental, intellectually snobbish, condescending, pessimistic, self-defeating, bitter, rageful, and distrustful, his face is almost indefinitely plastered in a skeptical mask of pursed lips and raised eyebrows behind tiny, narrow-view spectacles. His desire for isolation culminates in creating a true Fortress of Solitude where his girlfriend has left him, and he seems physically unable to escape the self-imposed prison of his bedsheets and missed phone calls. His salvation comes at the time when the audience reaches our own revelation. He is finally able to discuss his family’s secret Huntington’s disease freely and openly with the only person who cannot answer back: his aunt. The confrontation between Steve and his father immediately afterwards is a rapid succession of anger, violence, confusion, and forgiveness. Steve’s penitence finally finds a vehicle in Superman, and he can finally live in a world outside his own narrow constructs. That is how Clark Kent’s alter ego can finally make sense. Whether it is escapism or small everyday acts by ordinary people. He can finally write his Superman story. In medical school we are taught the physiology and pathophysiology of the brain and nervous system. We are taught about progression of this disease, prognosis, and modes of transmission. We are taught what to say to patients, and how to do so in a manner that displays empathy. We have proceeded tacitly thinking that because information is available, it should be impressed upon all patients and family members. What It’s a Bird offers to all readers – other than tackling small themes like memory, time, identity, existence, and progress – is the argument that how a family handles and processes information itself can be tantamount to medical intervention. Especially when that disease has no cure. In the words of Jack Nicholson from “As Good As It Gets,” they are drowning, and all we are doing is describing the water. In the time since its inception in 2004-2005, It’s a Bird has rightfully entered the canon with some of the most revered graphic novels of all time. 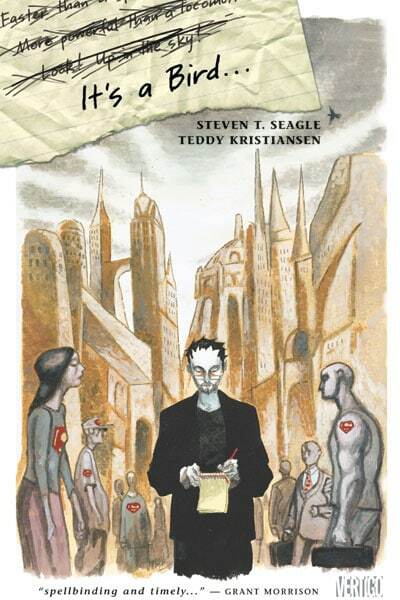 It is a tough read, and doesn’t flow the way many other graphic novels do. Instead it provokes, in tiny powerful ways (in a truly transcendent vignette, Steve contrasts a middle class woman worrying about remembering birthdays with a poor child who believes days of birth are not worth celebrating), and can sharpen our personal beliefs into knives pointed at our own throats. But if our narrator wants to draw blood, it is only so that we understand his torment, before we can finally cheer his deliverance.